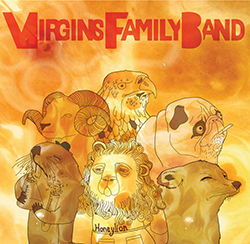 Production: All songs written and recorded by Virgins Family Band. Recorded at Nightsound Studios in Carrboro, NC. Mixed/Mastered by Aviv Marot. Album Art by Ellis Driver and Gabriel Anderson. Pretty harmonies and melodies open this album and I enjoyed listening to the entire thing. Saman and Gabe were High School pals in Miami. They recorded together then in the classic garage (or, in this case, bedroom) style and then went their separate ways to college. Each played with bands during those years, but kept in touch personally and musically and eventually, Gabe left Florida to join Saman in North Carolina so they could pursue their vision in total commitment. After years of a revolving door band, they finally settled into the group they are today, preparing to release "Honeylion" next month and touring the Southeast as well as North Carolina festivals. This is not a dance band, they're a mellow mood with clean vocals and romantic lyrics, so pack some vino in the picnic basket and check 'em out when they come to your town. It's worth the time.